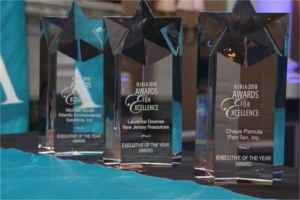 The New Jersey Business & Industry Association is accepting nominations for its annual Awards for Excellence competition, which recognizes outstanding businesses and their leaders who have improved New Jersey’s economic climate and quality of life. Award nominations are open for Executive of the Year, Outstanding Employer and Community Service until 5 p.m., May 24. Winners will be given prominent recognition in NJBIA’s magazine, New Jersey Business, which is read by over 120,000 top executives across the state and in its daily e-news service, New Jersey Business Today. A news release announcing the winners will also be sent to media statewide, as well as short videos spotlighting each business or leader who wins an award. Companies that have won within the past three years cannot be nominated again in the same category. The complete contest rules can be found here. All nominees must be members of NJBIA. For questions about the awards, or membership status, contact Jasmine Garrett at 609-858-9518.